Calrec Audio has been selected to provide five Artemis Consoles to NBC Olympics, a division of the NBC Sports Group, during its production of the 2014 Olympic Winter Games in Sochi, Russia, from Feb. 6-23. 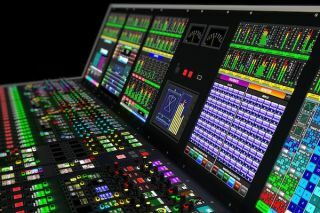 NBC Olympics has purchased two 64-fader Artemis Shine consoles and augmented its arsenal by renting a further 40-fader and two 24-fader Artemis Beam consoles from Calrec. "We are extremely proud to be the mixing console manufacturer selected once again by NBC Olympics during the Olympic Winter Games in Sochi," said Henry Goodman, head of sales and marketing, Calrec Audio. "After the success of the Summer Games in 2012, we are delighted to continue working with NBC Olympics and thank them for their belief in Calrec by choosing our desks." Karl Malone, director of sound design, NBC Olympics said: "We are pleased to be working once again with Calrec Audio. The Artemis console's reliability and consistency will help us to achieve outstanding audio quality across our NBC Olympic venues. The fact that Calrec consoles are now the industry standard helps the audio mixers engage immediately with the artistic elements of the production, which previously might have taken more of their time." Additionally, Calrec is supplying many stageboxes in digital, analog, and MADI formats to fulfill the I/O requirements. Calrec is also providing NBC Olympics with on-site engineering support prior to and during the Games. Calrec has been supporting NBC Olympics with on-site engineers since the Atlanta Olympics in 1996.